One of the buildings spared when the Grafton Centre was built. 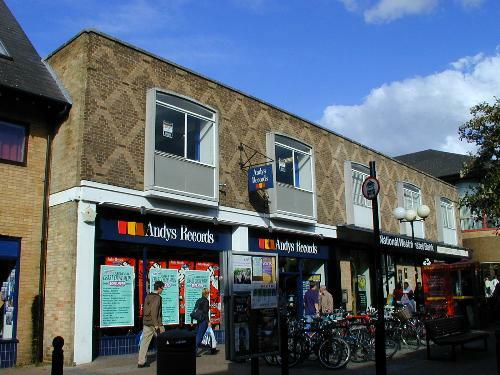 The store which occupied the left half (and the next building to the left) in 2000 was Andy's Records. The proprietor, Andy Gray, started out selling records in Felixstowe and then opened up a stall on Cambridge market in the early 1970s. In 1999 there were 40 stores nationwide but the downturn in the traditional retail music industry took its toll and the chain went into administration in May 2003. The Cambridge store closed in September 2003.